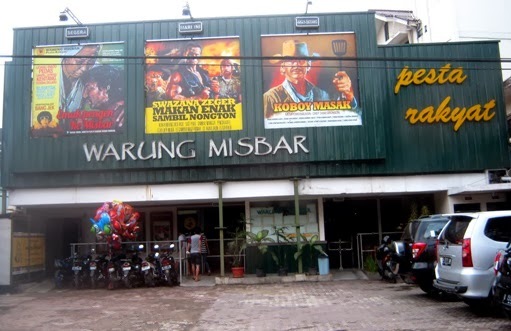 It’s really an eating place in Bandung (West Java, Indonesia). Captured from a moving car when I visited the city last Sunday. We had no time to drop by as we had to attend a family event. Makes me smile: Cooking Cowboy -Introducing Chef Dani Bronson. The words below are some of the food menu. 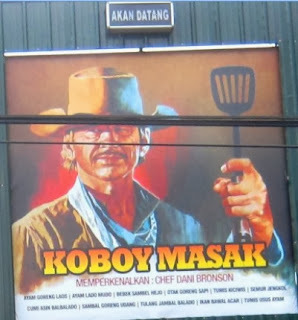 He's Charles Bronson, right? Do you still remember him? The restaurant has been designed by creative people. It said that the restaurant visitors can eat while watching old movies in big screen there. Hope I can enter this theater –eh- restaurant one day. Always a joy to visit your blog! Yeah, looks like a cinema, a vision really interesting! Great shot of the place. AN interesting theme for a restaurant! I love old Charles Bronson movies!